This project consisted of removing 2.5 miles of treated water transmission line from WYDOT right-of-way and relocating it onto private land. This project was required by WYDOT to accommodate the expansion of US Highway 14A from two lanes to five lanes. The project was awarded to Garney Wyoming, Inc., of Chugwater, Wyoming on August 15, 2011. The project was complete on August 1, 2012. 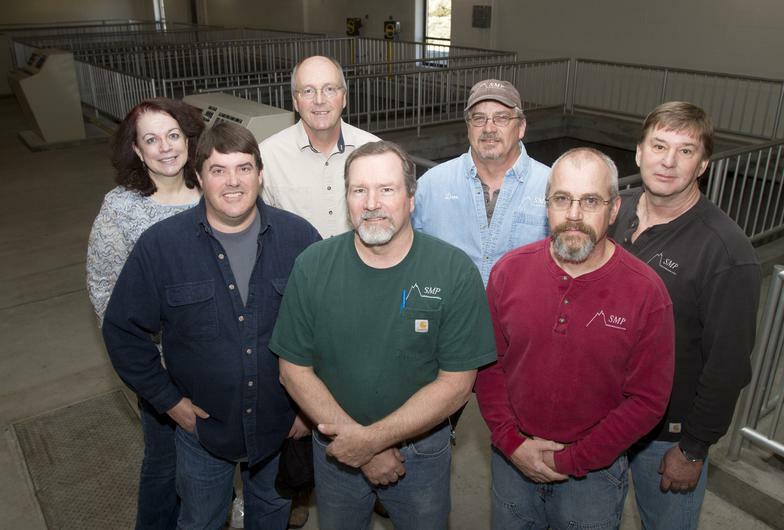 This is the first phase of upgrading the SCADA (Supervisory Control and Data Acquisition) system at the water treatment plant. This project was awarded to Browns Hill Engineering & Controls LLC of Littleton, Colorado, on April 9, 2012. The project was complete on October 31, 2012. This project consisted of repainting the elevated storage tank in the Town of Byron. The tank was originally constructed and painted in 1990. 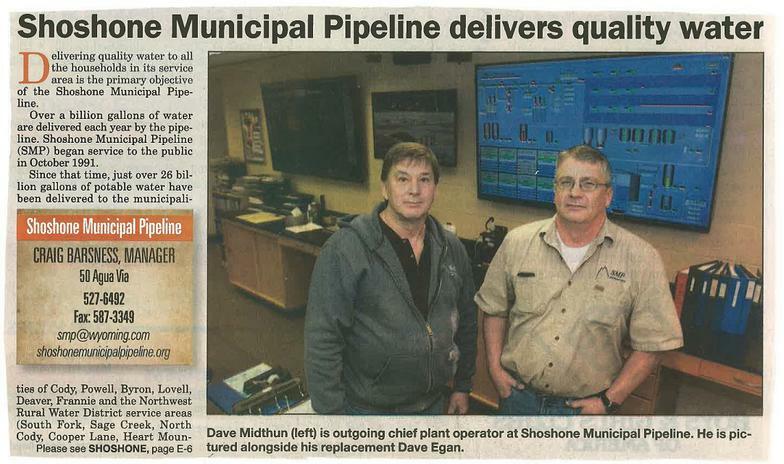 The project was awarded to Classic Protective Costings of Menomonie, Wisconsin on May 14, 2012. The project was complete on November 11, 2012. This project consisted of repainting the elevated storage tank in the Town of Frannie. The tank was originally constructed and painted in 1990. The project was awarded to L.F.W. Sandblasting & Painting, Inc., of Plattsmouth, Nebraska on March 9, 2009. The project was complete on October 30, 2009. 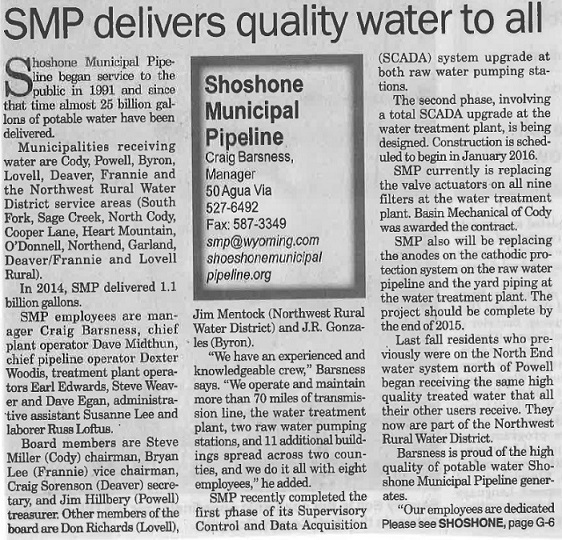 In 2009, Shoshone Municipal Pipeline (SMP) implemented a $650,000 upgrade to a safer method of disinfecting water. Instead of using gas chlorine, SMP will use salt to produce a sodium hypochlorite solution for the disinfection process. Sodium hypochlorite is a "weak bleach" solution that is 5 times weaker than household bleach but still potent enough to disinfect water. The reason for this change is safety. The equipment for the project was provided by MIOX Corporation of Albuquerque, New Mexico and the equipment was installed by Basin Mechanical, Inc. of Cody, Wyoming. This project was awarded to Rawhide Mechanical on August 8, 2013. Engineering was done by Con'eer Engineering. Work will begin on September 13th, 1013. Anticipated completion is December, 2013. 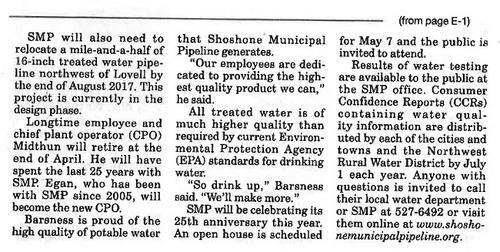 Shoshone Municipal Pipeline (SMP) will increase the monthly tap equivalent fee by $1.00 per tap equivalent, from $9.00 per tap equivalent per month to $10.00 per tap equivalent per month. This increase becomes effective July 1, 2014. This is the first increase in rates or fees since July 1, 2009 and only the third increase since SMP began delivering water in October of 1991. The wholesale water rate of $1.34 per thousand gallons will not change. 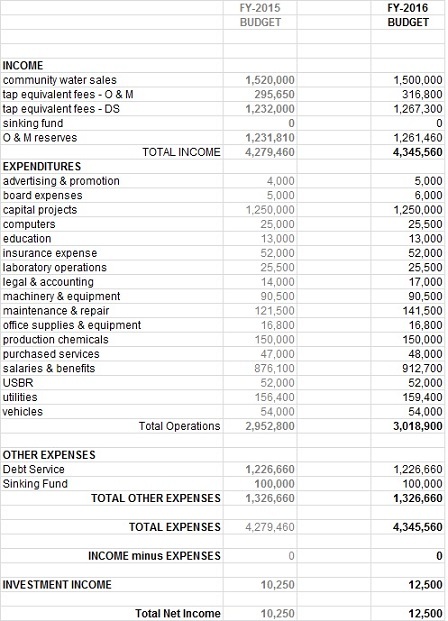 The increase is necessary due to the expense of increased operating costs and upcoming projects including the completion of a total SCADA (Supervisory Control and Data Acquisition) system upgrade at the water treatment plant and both raw water pumping stations and the replacement of valve actuators on all of the filters at the water treatment plant. The estimated cost of these two projects is just over 1.3 million dollars. The increase affects customers served by the municipalities of Cody, Powell, Bryon, Lovell, Deaver and Frannie and the Northwest Rural Water District. 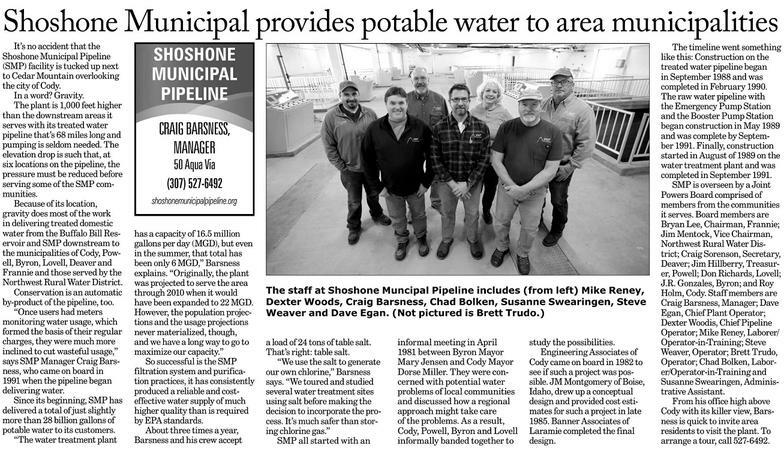 If anyone has questions concerning their water rates or tap equivalent fees, you are welcome to call your local water department or call Shoshone Municipal Pipeline at 527-6492. We regret to announce the passing of our former Manager, Lowell Anderson, who served Shoshone Municipal Pipeline until his retirement in 2008. The Pipeline Relocation Project near the Oasis Junction in Lovell is now complete. SMP relocated 6,200 feet of treated water transmission pipeline, including the crossing of the Shoshone River. Wilson Brothers Construction, Cowley, was the general contractor. They did an outstanding job on the project, despite numerous challenges.